Explanation: A bright nova was discovered Saturday that is currently visible to the unaided eye in southern skies. Nova Velorum 1999 was recorded near visual magnitude 3 independently by discoverers Peter Williams and Alan C. Gilmore (Mt. John U. Obs. ), making it more luminous than many famous bright stars. The last nova this bright was Nova Cygni 1975, which peaked just brighter than magnitude 2. Nova Velorum 1999 is brighter now than the well-studied Nova Cygni 1992 ever appeared. A nova occurs when the surface of a white dwarf star undergoes a tremendous thermonuclear explosion, throwing off its outer layers. How the nova will appear over the next few weeks is uncertain, but the exploding debris will likely fade beyond detectability over the next few years. 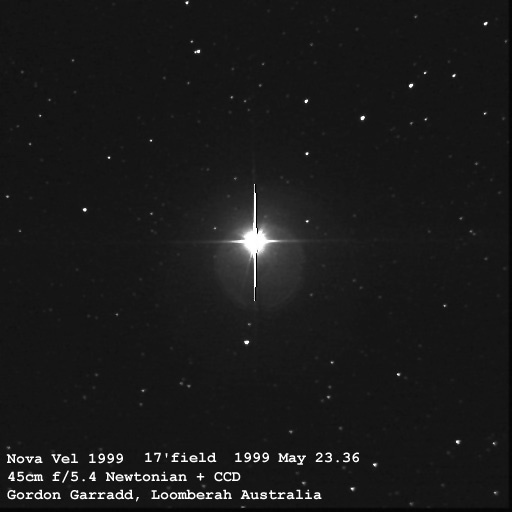 The above photograph of Nova Velorum 1999 was taken yesterday from Australia. The cross-hair like spikes that appear around it were caused by the photographing telescope and camera.